Advent is the period of anticipation roughly between Thanksgiving and Christmas leading up to the celebration of Jesus' birth. Families traditionally use their Advent candle wreaths as centerpieces and light a specific number of candles each week during dinner followed by a meaningful reading. 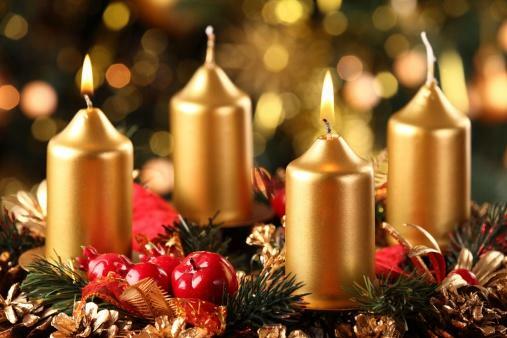 Advent candle meaning is slightly different in each faith because the colors of the candles can be different and the overall meaning of the event varies. Purple: This traditional color symbolizes penitence, or regret for sins, and penance, or self-imposed punishment for a sin. As the color of royalty, purple also speaks to the birth of the new King, Jesus and serves as a reminder of his suffering. Pink: Most often used on the third or fourth week, pink represents rejoicing. As many people see the end to their fasting approaching, they prepare to celebrate. Blue: Resembling the night sky or the waters in Genesis blue can also symbolize royalty. This color represents hope. Red: As a symbol for communion and a prominent Christmas color, red candles have German roots or can be used to promote religious unity. Green: When used in Advent, green represents faith or the spiritual life. White: A large white pillar candle in the center of the wreath represents Christ and the peace he brings. Gold: This opulent color represents love and kingship and symbolizes the Christmas season in some religions. Advent wreaths and candles are more than another holiday decoration. These symbolic items represent the beliefs of different religions in a way that recognizes why they are celebrating Christmas. For many Christians of varying denominations, Advent is seen as a time to prepare for the celebration of Christ's arrival. Each candle represents one aspect of the waiting and is lit to signify Jesus bringing light into people's lives. 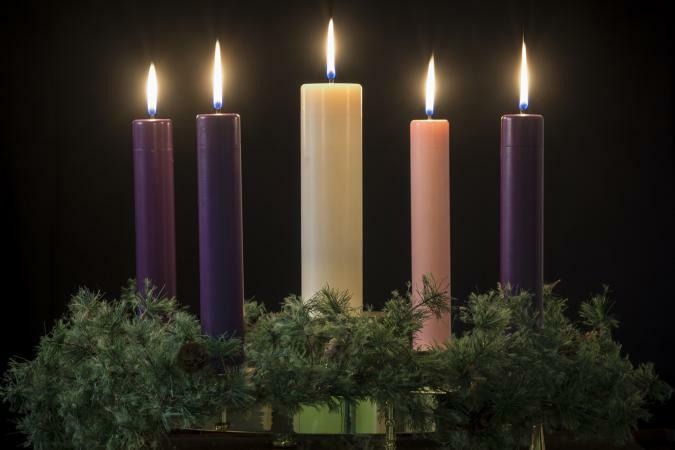 In Catholic households, the first two candles are purple in conjunction with the color of penance and the color worn by priests, the third is pink for the color of rejoicing, and the fourth is also purple. Orthodox Christians observe Advent for 40 days using six candles with one each in green, blue, gold, white, purple, and red. Some Lutheran churches in the U.S. use four blue candles to represent hope and expectation while others follow the Catholic version. In Protestant churches, you will often find blue candles used as well or instead of the purple candles because their view of advent reflects more on hope and expectation rather than an arrival and preparation. Advent wreaths are often used by families in the home, not necessarily in a church. These personal ceremonies speak to each family member's beliefs and values about the holiday season.